Stephen Mallatratt’s “The Woman In Black” is a theatrical oddity, being the second longest-running non-musical play in the history of London’s famed west end theatrical district. The longest-running play is Agathie Christie’s “Mousetrap”. As such, ‘The Woman In Black’ is more of a tradition than a play, a treat for Halloween designed to provide some good predictable thrills for the season, like ‘A Christmas Carol’ is designed to provide some predictable sentimentality. As such, this contraption is more of a haunted house than a play, its impact depending almost entirely on design and special effects. In that respect, the production team at Douglas Morrisson Theater has done a superb job, with great attention to detail. George F. Ledo has convincingly transformed the auditorium to look like a Victorian jewel box theatre. Equally wonderful are Will McCandless’ haunting sound design, Matthew O’Donnell’s spooky lighting, and John Lewis’ deliciously rich costumes, all conspiring to transport us into a Victorian ghost story. The play is full of persuasive special effects: we embark on both a train ride and a buggy ride, and travel through a scary bog on a road to a haunted house which we see rising spookily in the distance. There is a lot of theatrical trickery such as the convincing creation of a dog entirely through pantomime and actors who play multiple roles switching from one to another in rapid succession. Everything is beautifully constructed for maximum haunting value. 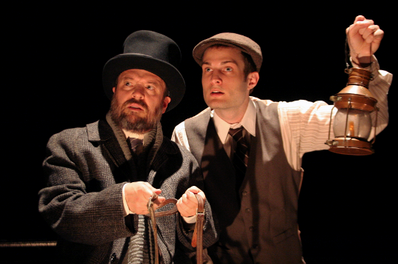 C. Conrad Cady (L) and Mark Frazier (R) in Douglas Morrison Theater’s haunting production of “The Woman In Black.” Photo Credit: Douglas Morrisson Theater. Altogether, it is a triumph of mood over content, by which I mean that the story of the play itself does not live up to the special effects and the marvelously spooky atmospherics. I found it dull, when it wasn’t confusing. But, the stars of this show are the designers, and they deliver impeccable performances. If you are the sort of imaginative person who responds strongly to mood and image, this show will be quite a treat. The premise of the play is that an elderly solicitor has hired an actor to coach him in telling the story of experiences he had as a young man, involving a ghost. Together, he and the unnamed actor proceed to flesh out all the characters as The Actor coaches the solicitor on how to present his tale. The two actors are both quite good. C. Conrad Cady is fine in a variety of roles requiring multiple physical and vocal transformations. Mark Frazier makes an impressive Bay Area debut. Handsome indeed, with a profile uncannily kin to a Barrymore, remarkably tall, moving with grace and possessing a polished vocal and emotional technique, Mr. Frazier is likely to prove irresistible to casting directors. He will be making a lot of noise around here. “The Woman In Black” adapted by Stephen Mallatratt from the book by Susan Hill, produced by Douglas Morrisson Theatre. Director: Marilyn Langbehn. Scenic Design: George F. Ledo. Lighting Design: Matt O’Donnell. Sound Design: Will McCandless. Properties: Tom R. Earlywine. Costume Design: John Lewis. Actor: C. Conrad Cady. Kipps: Mark Frazier. The Woman: Cynthia Lagodzinski.